Once you and your betrothed sign up for wedding dance lessons, here’s everything you need to know to prepare for your first time in the studio. Every class at the Arthur Murray Lincolnshire Dance Center is designed to help you relax and have fun. If you have any specific questions or concerns beforehand, feel free to give us a call at 847-821-9321 or send us a message. 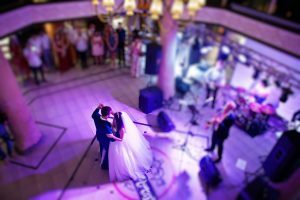 If you’ve never danced before and you have no idea what to expect for your first wedding dance lesson, here are some answers to the most commonly asked questions. A: Simply wear comfortable clothes that are easy to move in and make you feel like dancing. You can even dance in the clothes you have on from work. Avoid rubber-soled shoes and anything restrictive, like tight jeans and skirts. If you can, we recommend bringing the shoes you plan to wear during the actual dance on your wedding day, so that you can get used to moving in them. As you get close to the big day, it’s useful to have a “dress rehearsal” in clothes that mimic what you will wear at your wedding. Q: What style of dance will we learn? A: It’s your choice. The style depends on the song you choose and the style you and your partner prefer. Most songs work with several dance styles, and our instructors are experienced in most styles of dance. Once they’ve heard your song, they will demonstrate the dances that will work best for your wedding. We’ll help you decide which one makes the most sense for your song, skill level and personality. Q: What do I need to know for my first lesson? A: Wedding dance lessons at the Arthur Murray Lincolnshire Dance Center are completely newcomer-friendly. You don’t need to have prior dance experience before coming in. Our expert instructors will introduce you to the basics you need. The focus is to get you comfortable and plan the rest of your lessons leading up to your wedding. Because all dance lessons for wedding couples are personalized by your friendly instructors, your first day will be tailored to your needs. Remember to bring your first dance song (if you have it) and come ready to have fun. If you haven’t signed up for a lesson yet, contact us today to get started.